My dad was 55 when he decided to learn how to read and write. Having seen his children through school and into college and with my mother and him having an emptier house, they took it on themselves to find out where and how he could finally get rid of the one thing that he felt was holding him back. It was never discussed that my dad couldn't read - I knew he didn't read but it was one of those family things that was glossed over, never talked about. My mother taught me to read at an early age and was always the one that I went to for guidance on pronunciation or spelling, despite herself having left school at 13. 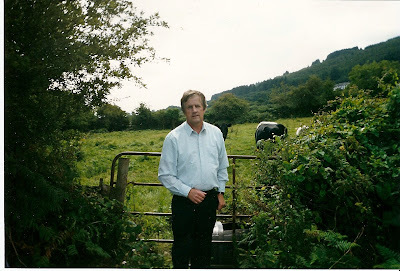 Dad was a builder, a labourer, he worked on the land, he had a few cows. He'd never be accused of intellectual pursuits - TV was the news, the GAA and the Sunday Game, maybe a bit of Glenroe. He'd be silent while we'd shout out the answers to Where in the World or to Countdown, the odd time the weather was good/bad enough to make out the faint signal. He "wouldn't be bothered with books now at all, though make sure you do your lessons and learn. That's very important". 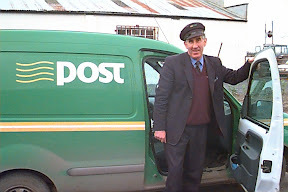 The postman wouldn't have been as much welcomed as feared if my mother or sister weren't around. Forms would not be signed. Bills would be paid if he recognised the colours or knew where to pay them, but otherwise nothing. How he got through and managed is a testament to his own resourcefulness as well as the support of his wife. It was only late into my teens I began to ask Dad about his youth, about growing up, where he was from and what he did when he was younger. I'd been happy enough to accept the fobbed off answers when a child, but the more my identity became important to me, so did the identity and story of my parents. Being in a small village things like this were not talked about, were not acknowledged. After all, what would the neighbours say? When I was studying in Dublin, he decided to start to learn the basics. 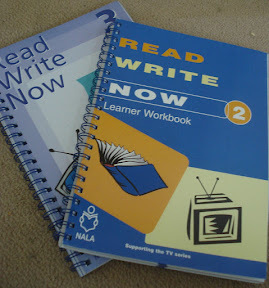 TV programmes like Read Write Now were coming on air and with the help of the local health board he found a tutor to give him weekly lessons. He started out on the basics - writing his name, his address. He moved to sentences, to verbs, to spelling and some grammar. He worked his way through basic books and beyond on to more complicated lessons, where he was reading and comprehending, answering questions and writing down his own memories, telling his own stories. Every time I go home now I see him working on something. He has three big folders full of exercises and he'll lift up a newspaper now to try and understand. It has made him more confident, more empowered to deal with things, to not be daunted by bills or forms or long words. He breaks it down until he understands. He may not be online yet but he's getting there. And I'm very, very proud of him. Even if this target is achieved it means that Government accepts as okay that there will be between 320,000 and 475,000 people with basic literacy problems in Ireland in the working age group in 2016. NALA, the National Adult Literacy Agency do amazing work in this area. At present there are more than 28,000 people participating in VEC adult literacy programmes. This is more than a four-fold increase since 1997 when 5,000 people were attending the literacy service and 25% of the Irish population were found to be at the lowest level of literacy. Tonight I watched their latest TV series, Written Off? The show follows the progress of eleven individuals embark on an education course not only designed to teach them to read and write, but to attempt to improve their lives dramatically. There's a wide mix of people ages from 17 to 52 - the street trader from Dublin, the homeless 18 year old, the Cork taxi driver whose business failed under the pressure of getting through the paperwork and more. It's quite an inspiring show that RTÉ and the production company, Animo TV should be congratulated for. The bravery of these people to both do the course and to do so on camera should not be underestimated. Most of us would be daunted enough about saying "I don't know this" but doing so to the whole country on National TV about something most people think everyone does anyway is something else. A round table discussion at the Kilternan Open Market in tonight's show was fascinating - a local farmer shared his story of being able to read but whose spelling and numeracy were very poor, so when Department of Agriculture forms or the like came in, it presented a monumental challenge. He's now doing his Leaving Cert after doing maths and English in his Junior Cert. As he described his challenges, the eleven around him nodded their heads in recognition and were delighted in his success, recognising how much effort it had taken and seeing that they were not alone. One woman was delighted at her new ability to fill out an Xtra-vision application form. Thank God we as a nation seem to be facing up to problems like this, that we're empowering the people who didn't have the opportunities to learn to access the information, to get that level of confidence and skill that so many of us take for granted. The more we talk about things, to show that it's okay to admit that we can't read or write so well, that we can't use computers or Google, that we don't know how to comment on blogs the more opportunities to learn we can create and the more people we can help. If you know anyone who could do with help with their literacy, please direct them towards the NALA website or freephone 1800 20 20 65. They'll get materials posted out to them which they can then use at their own pace in the comfort of their own home. 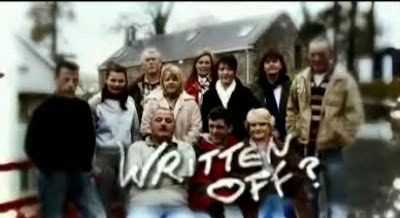 You can watch the previous episodes of Written Off? here. Labels: adult literacy, Cori, family, National Adult Literacy Agency, RTE, TV, Written Off? Ah, Darragh, you just keep out-doing yourself. This brought a lump to my throat - you should be extremely proud of him. Great Post. And he is a lovely man on top of it all. @Green Ink - cheers for the comment and the visit. Appreciated! that's a lovely post and I also really love the top photo. You must be going for another blog of the month award... ;) great post! Brilliant post Darragh, very well-written. Great post, your Dad must be such an inspiration. You are a brilliant writer Darragh, I love your style. I've recently been encouraging my mum to use the internet, she has a fear of computers, she thinks touching the wrong button could somehow break the computer. I try to encourage her, I know she would be so happy to be able to pay bills, book flights, etc. This was a very much inspiring post, it goes to show it's never to late to learn to read or write, your dad is an inspiration and fair play to him for having the courage to embark on this difficult task, and fair play to him for perservering & not giving up when it undoubtedly got very hard and frustrating for him. Your mam is an inspiration also as she helped your dad for so many years and has given and continues to give him unwavering support. You are right to be so proud of both of them. lotsa people from that generation and older that weren't well educatedround here and instead of attempting to improve themselves just try to drag other people down. See how I divert comments in therapy sessions? 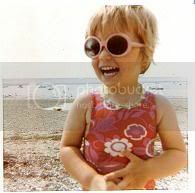 @EnglishMum - hello and welcome to the blog! I am indeed very proud. Thanks for sharing about your Grandad! @mj - thanks :) MY intention though is only to tell the stories, that's all! @niamh - Ah I think he's happy enough away from the computers. I'll teach him how to use Sky first. @B - You are a fierce interesting person. I'm looking forward to hearing more of that story! darragh you are belting out brilliant posts at a phenomenal rate recently. Go enjoy the sunshine! seriously though, I'm very impressed by what your dad has managed to do and this is a great tribute to him. That is an amazing story, I do think that we take it so much for granted that everybody can read. Kudos to your Dad for all this hard work! As someone who struggled with reading all my life I appreciate what your father has gone through. More power to his elbow for t5aking up the challenge. thanks! won't be getting it though, mostly fiction cos I'm mostly anonymous. and mr andrew's right, I'd give you a daily newspaper column in a heartbeat. Andrew king from Written off?